We've just heard an interesting pre-E3 rumour: Nintendo could announce a localisation of Tomodachi Collection for 3DS. We've heard whispers a Nintendo game known as Communicator Gamers Collection is on the way to the West, which would certainly fit as Tomodachi Collection's new title. Nintendo has said we'll hear about new 3DS and Wii U games in today's conference, which kicks off at 9am Pacific / 12 midday Eastern / 5pm UK / 6pm Central European. Don't miss it! The trailer couldnt have been more confusing. That was weird. Their voices are creepy and the lady with the long hair looks like Michael Jackson. Seriously, I would love this to be true. And with Ninty trying to show off Nintendo Network in a good light, and not 'just another online gaming network', it dosen't seem too unlikely either. For those who were a little confused by the video. The game itself is pretty much a Mii version of the Sims, where you use street pass to send your Mii into other people's games, you have an apartment where you can see the Miis live out their lives. I believe there's 2 or 3 of these games in Japan already for the DS. 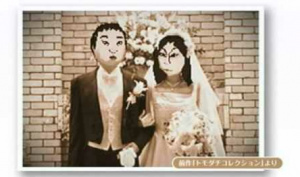 The video above is a little obscure especially if you don't know much about Japanese pop culture, but the Miis in the video are based on a pair of comedians that were once voted Japan's most ugliest celebrities, and Nintendo made a spoof of these two having a relationship and a child! lol God knows what the child looks like! In the latest game it was possible for Miis to have relationships, get married and have kids, if you play the Sims it's a common affair, but considering it's you and a random Mii you picked up through Street pass.... It's a bit dodgy in my opinion, lol!